I love super simple recipes like this. Especially when the result is so tasty that I’m ready to fill my plate for seconds and I’m visibly crushed because I know there’s none left in the pan. Poor me, I’ll just have to make this recipe again soon. Trust me, I will and so will you, I’m sure. This will be a staple chicken thigh recipe and I’m a chicken thigh lover through and through. One thing that is different in this recipe is that the chicken skin stays on the chicken. If you grew up in a house that banished any notion of fat, the number one rule in cooking with poultry was that chicken skin must always be removed. And into my adult life, I’ve pretty much followed that rule hook, line and sinker. And with thighs, that is totally fine because thighs are juicy and rarely seem to dry out. But I was eager to try out this recipe as I’m a sucker for simplicity and with a come-on as enticing as Perfection, I could’t resist. The skin stayed on. And trust me, any extra calories are seriously worth it. This chicken that is easy enough to make on a harried weeknight. Despite it’s simple ingredient list- salt, pepper and a bit of vegetable oil, it’s really about technique and searing the skin to get really crispy results. Did I mention that it only takes 35 minutes? Perfection does come with a bit of a cost. The only real drawback to this meal is that it is a bit messy. The oil and the chicken fat does splatter, but it’s not enough of a mess to call the whole thing off. Just steer clear of the pan while it’s on the stove to prevent random burns and do a quick wipe down when you put the pan in the oven. The resulting chicken is one with super crisp skin and a moist and juicy interior. Biting into it had me smiling from ear to ear. This isn’t as fussy as traditional fried chicken but it was incredibly delicious! Hello pan perfect chicken, we’ve become fast friends indeed. elsewhere: Pop over to Poppytalk and take a gander at a very lovely no-fuss Blueberry Almond Norwegian Tea Cake. It contains no butter or oil and it’s completely delicious and easy to prepare. Preheat oven to 475F. Season both sides of the chicken with salt and pepper. Heat oil in a heavy cast iron skillet over high heat. Add chicken skin side down and cook for 2 minutes. Reduce heat to medium-high and cook for 12 more minutes skin side down, rotating and rearranging chicken to evenly distribute heat until the fat renders and skin is golden brown. Move skillet to the oven and cook for 13 more minutes, still skin-side down. Turn over chicken and cook for another 3-5 minutes. Remove from oven and transfer to a plate and let it rest for 5 minutes before serving. I absolutely love the simplicity of this, and it looks so delicious! So perfect for a weeknight meal. Yum!! There is nothing better than simply seasoned chicken (WITH skin, for sure), that is crispy and tender. When it comes to chicken, my go-to is usually just a whole roasted chicken, but I’m curious to try out this method! I love it when super simple recipes end up blowing you out of the water! I only recently came around to chicken skin, but now that I’ve converted, there’s no going back. Love the simplicity, and I can tell from the photo how delightful that crispy skin was! Thanks CookiePie, it is so perfect. Enjoy it! Thank you, Barefeet. So true. And yes, that cake is a good one. those look fabulous. nothing beats panfried chicken skin.my mouth is actually watering. Shellie, these are soooooo good! Yes, to the skin! Bijoux, it’s all the the technique. 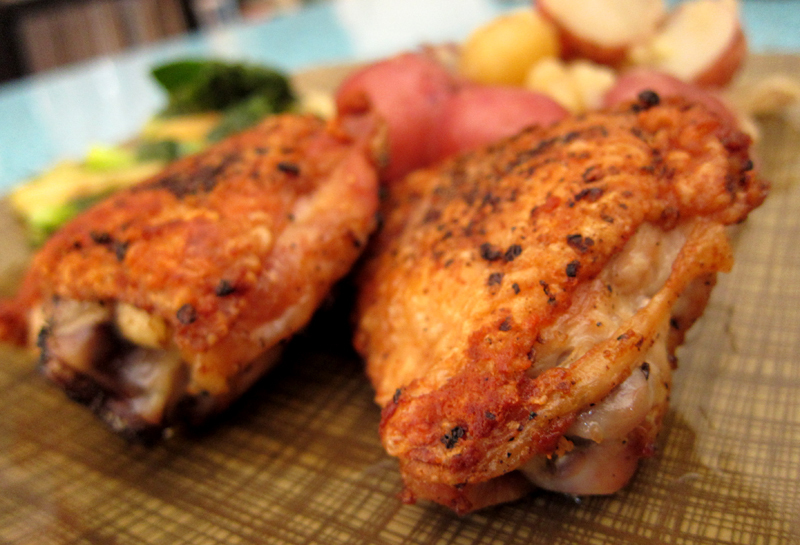 Yes, we always buy organic thighs – cheaper & delicious option. Hooray! Even simpler and easier(better) is to not use the oven at all! Just keep the thighs in the pan after a short 1 minute med-high sear. Turn the heat on the stove way down to low. To the non-skin side (facing up), now is the time to more flavor with add a little mrs dash (herb and garlic), touch of curry powder and/or cumin powder, along with your good sea salt and fresh cracked pepper. Then leave it alone uncovered for a 15 minutes to slowly crisp up and render the skin before turning it over to cook the non-skin side for 10-15 more minutes. The skin will have a light brown crispiness and the fat will render out nicely. Mmm, sounds delicious, Chef Mike! I made this last night and they came out fabulously! And they looked just like the picture. That never happens when I cook. Chelsea, so glad they turned out so well – it’s such a simple recipe that it’s easy to get fantastic results! No better cut of chicken than thighs. Sometimes I wonder why I even do whole chickens. I should just do thighs…like this! I have to confess, I have never removed the skin from a piece of chicken. That’s where the best flavour is! I should be as big as a house. I would love to try this recipe. Looks like a home-style KFC. KFC is a weakness of mine so if I can have a freerange version at home, all the better! I love whole chickens too, Adrianna, but it’s nice to just have the thighs once in a while! Enjoy. Bunny Eats, so funny! I think it was my mom who engrained all that no-chicken-fat stuff on me. Luckily, thighs are so juicy that it’s okay. But this recipe needs the fat. Yum!! I love fried chicken with a glass of rose sparkling wine. I’ve uncharacteristically left two comments now in a very short timespan, which speaks to how absolutely delicious these chicken thighs were. I was compelled. You’re right: I have a new favourite. Aw thanks Meagan, glad to hear it! I made these last night, they were PERFECT! I want to make them for everyone I know! I’m not much of a cook but my chicken thighs turned out GREAT! The funny thing is, I’ve been avoiding meat ever since I moved out of my parents’ place solely because I can’t cook it very well. Thanks for helping me introduce meat to my diet again with this perfectly simple recipe! I am making these now, but they burned after the first two minutes, why??? Megan, what kind of pan did you use? 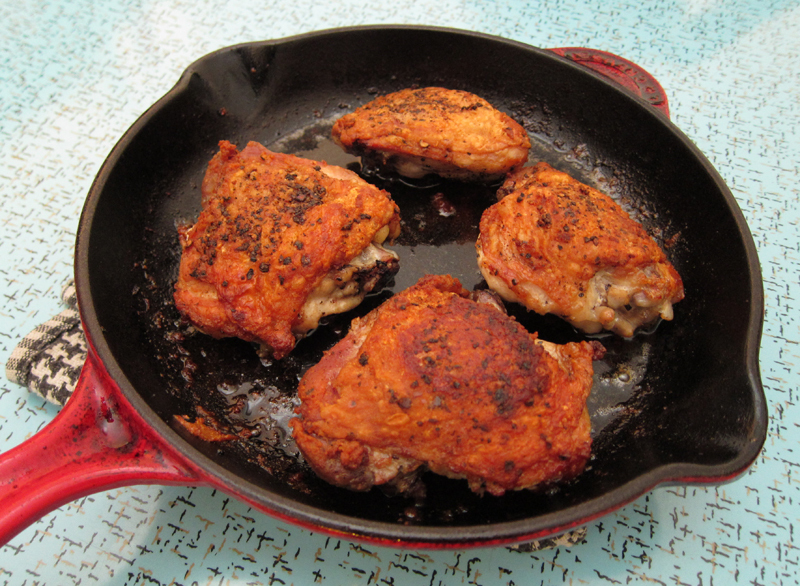 I’d recommend a heavy cast iron pan – if you have something thinner it might burn the chicken. I’ve made this a couple of times now with no burning. If your pan is thin, turn down the heat a bit so it’s still hot but not scorchingly so. I hope it helps! Made this tonight & it was a hit w/my guys! Thanks for sharing! I make this several times a month. So easy, and simply delicious! Awesome! Family loved it! Thank you! And so easy….. If only the clean-up was easier! Worth it tho! I make something like this and it’s even easier: Season both sides of the chicken thighs with salt, pepper and poultry seasoning and place on a broiler pan. Bake skin side up for 50 minutes at 400 degrees. Another method is to put cookie cooling racks on a cookie sheet so that the grease drips away from the meat. Both methods ensure lovely, golden brown & crispy skin. Lezlie, great tips – I’ll try your version with the cookie racks. The skin stuck to the bottom of the skillet while it was cooking skin side down 🙁 i was afraid this was gonna happen…. Any advice? SR, what kind of pan did you use? I think a heavy cast iron pan is best. The pan has to be hot and all that rendered fat should help to not make it stick. Are you using tongs or a spatula. A gentle touch with tongs would be best, I think. I”ve made this a few times now & haven’t had that issue so I’m not sure what the problem could have been. Never again! The whole house filled with smoke. Bummer Paula, maybe your heat was too high? 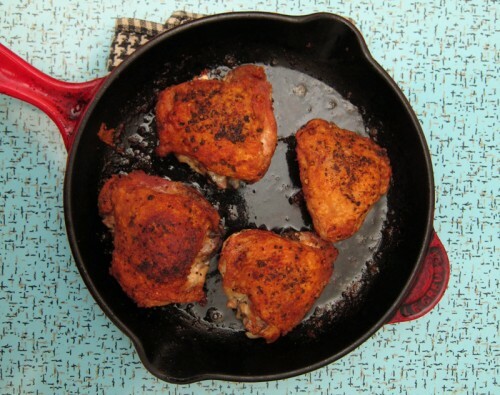 Did you use a heavy cast iron skillet? I find the heavier the pan, the better it regulates the heat. Found you from Pinterest! Made these today from frozen thighs. Delicious! Came out perfect and full of flavor. Thank you! I did use a heavy cast iron skillet. I love cooking chicken thighes this way, but have found that putting the oven on 475 is too high. I set my oven to 425 otherwise my house fills with smoke also. Tonya, I think lowering the temperature would be fine – especially if it fills your kitchen with smoke. I loved reading this recipe–took the words right out of my mouth. I’m a chicken thigh lover too and can’t wait to try this soon. Thanks! I just found this recipe and it looks fantastic. But… I don’t have a cast iron pan so I’m afraid to try it 🙁 Bummer! I am in the process of making this right now. Changed it spa bit tho. Cooked it on stovetop 2 mins and put it in the oven for 30 mins then I will flop it over the last 5 mins. Using my Emril pan so I turned oven down to 450 also added dash of garlic powder along with salt and pepper. Smelling really good. I would have done it the other way but can’t stand long enough to keep an eye on it. Should be done when my son gets here so he can take it out for me.